UFC superstar Nate Diaz shocked the world when he choked out Ireland native Conor McGregor on short notice back at UFC 196. Since then, the two talented mixed martial artists have gone 1-1 in their UFC pay-per-view record breaking rivalry. 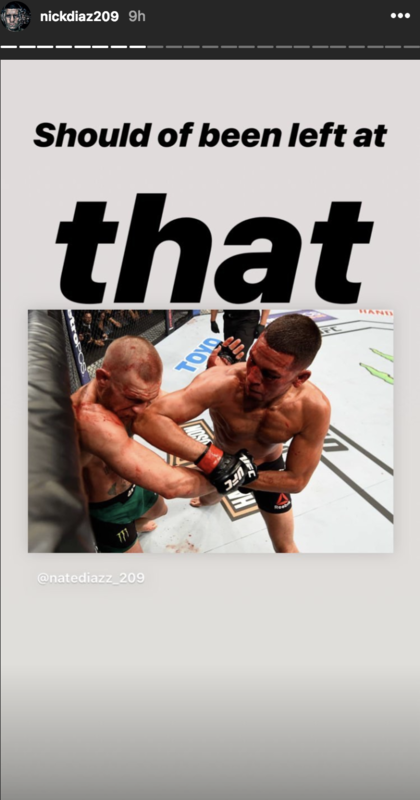 Nick Diaz, UFC veteran and older brother to Nate Diaz, has now come forward with a statement concerning his younger sibling’s heated rivalry with “Notorious. Neither Conor McGregor or Nate Diaz have competed within the octagon since back in 2016. However, McGregor is now set to fight UFC lightweight champion Khabib Nurmagomedov in the main event of UFC 229, live on pay-per-view Oct. 6. Meanwhile, Nate Diaz is set to face tough UFC lightweight contender Dustin Poirier in the co-main event of UFC 230, live on pay-per-view Nov. 3. With both fighters now set to make their massive octagon returns, Nick Diaz has now taken to Instagram Live to share a statement concerning his younger brother’s heated rivalry with Conor McGregor.